Two blocks west of Carson Street on corner of Washington and Nevada Sts. I own a State Farm Agent office. 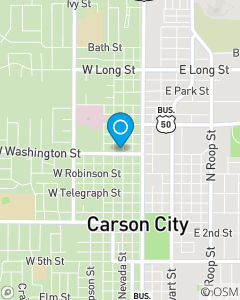 Our goal is to be the first choice for Auto, Fire, Life and Business Insurance in the Carson City area. It is our goal to provide superior service by going above and beyond the expectations of our customers in the Carson City, Reno, Dayton and Lake Tahoe area. My team members, Dani, Kristi, Trevor, Tony an Ashley have over 85 years of insurance experience and are here to help with your every need.